Brian Fraley in Capitol Hill. 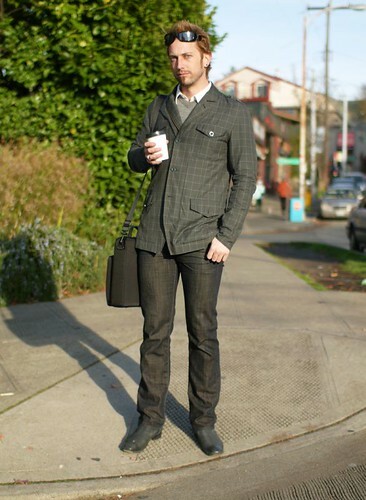 What a dapper gentlemen, there is certainly no shortage of his type in Seattle. Just one question for you Jasmin: Where are the young people on this blog?? You once had a pretty even mix of young and mature style, but it seems as though the teens and twenty-somethings have really fallen between the cracks! I think it would be great to publish some photos of hip kids to show the paper readers, even my mother, how our style is evolving. That comment made me smile. Honestly Jasmin you are damned if you do and equally damned it you don't! I've been looking at this picture for awhile. I can't decide if it is the fit of the jacket or the jeans that bug me. I think a touch of color would be a welcome addition on this outfit. Seth Green, is that you?!? Hi anon. - Brigitte's right that I feel stuck between a rock & a hard place when it comes to the age range I choose to photograph! Some very vocal readers feel strongly that the young 'hipster'-types are repetitive, & on the flipside, I get feedback like yours from folks who want to see more young people represented. I'm trying my best to balance both sides. jasmine- i think you do a great job of documenting young and old. seattle is full of young hip kids, but there are some aging stylish people as well. i'm always happy with the mix i see here. well done ! work daddy! i saw him at the eagle. he's shows.